UDCK's activities cover the places along the Tsukuba Express Line in the northern part of Kashiwa City, Chiba Prefecture, the development region around Kashiwa-no-ha Campus Station and Kashiwa Tanaka Station and its surroundings (approximately 13 km2). In this area, leading research institutions including the University of Tokyo Kashiwa campus and Chiba University Kashiwa-no-ha campus. There are also rich green spaces such as Kashiwa-no-ha Prefectural Park and Konbukuro Pond Natural Museum Park (construction planned). Chiba Prefecture and other organizations started the "Kashiwa/Nagareyama Region International Academic Research City Development Project" in 2003. 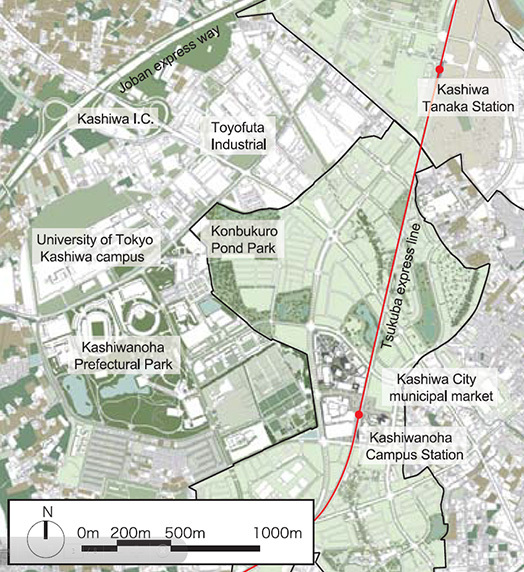 In March 2008, Chiba Prefecture, Kashiwa City, the University of Tokyo and Chiba University formulated the "Kashiwa-no-ha International Campus Town Initiative". 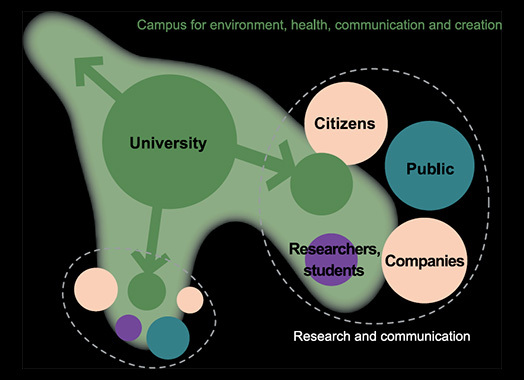 With the vision to realize the "International Academic Research City and the Next Generation Environmental City on Public, Private and Academic Partnerships", the Initiative specifies eight goals, aiming at the integration of universities and communities from the perspectives of space and activities, generating new cultures and industries. In December of 2011, Kashiwa-no-ha was designated as an Environmental Future City and Comprehensive Special Zone for Regional Revitalization by the Cabinet Office, based on the three pillars of: an "Environmental-Symbiotic City" that engages in environmental energy issues; a "City of Health and Longevity" in an ultra-aging society; and a "City of New Industry Creation" that challenges sustainable urban management and economic revitalization. The Station-Front District, which forms the central core of this plan, opened in July of 2014.